If you attended one of our four-day 'People/Children Handling and Risk Assessment Key Trainer's Certificate' or two day 'Refresher/Update' courses in 2017 your certificate will expire in 2019. Should you wish to continue delivering training, we would ask you to attend a two day ‘Refresher/Update’ courses in order to re-certificate for another two years. As many of you will already be aware, our two day training course is Endorsed by the Royal College of Occupational Therapists, Certified by the CPD Service and is worth 14 learning hours towards professional learning portfolios. Since you last attended training with us in 2017, this course has also been Accredited by RoSPA Qualifications as an Advanced Level 4 Award. Our new course textbook was launched at the end of 2018 and features a new layout, look plus additional content. In addition to receiving this as part of our core course materials, delegates attending EDGE ‘Key Trainer’ courses will be granted access to our new and exclusive online Resources Library and E-Learning Module. Our Resource Library holds a wide range of information which you can use to enhance your own learning and development and, crucially, includes a range of products; including quizzes, case studies, legal cases, crosswords etc, that you can use to make your own training courses more engaging to deliver. The E-Learning module has been designed for front-line care and education staff to undertake themselves and covers the theory component of people/children handling training, leaving you to focus on the delivery of practical skills training. 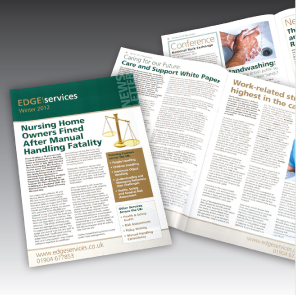 We hope that these new resources demonstrate our commitment to supporting you in your vital role and that you are able to update your training with EDGE soon. Places on our public training events are limited – book yours today!